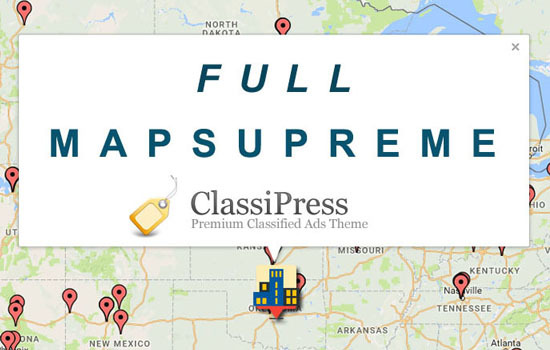 This plugin is only for the Clipper Theme version 2+ and clipper child themes home page. The idea behind the plugin is to give a new look to your website’s home page easily through a widget without any developer help. 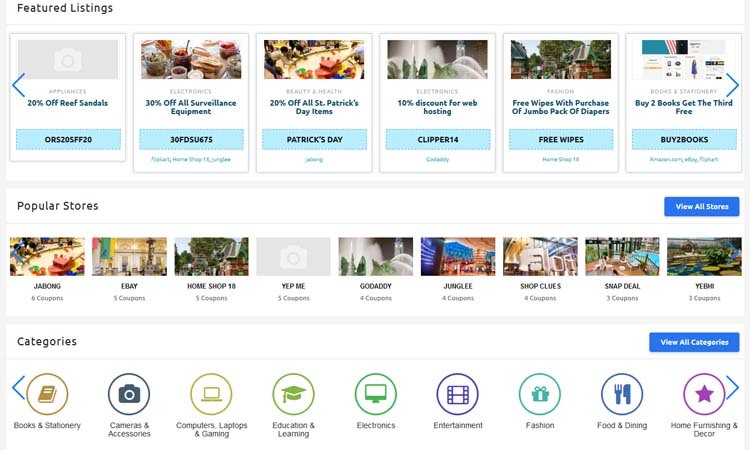 Display more coupons in listing & grid view with tabs to display more than one categories. The plugin makes Clipper theme home page widget ready and easy to manage. Via the plugin you should create/set new page template and it will make your home page widget ready by settings the page as home page from wp-admin > reading settings section. Both home page content section and sidebar via widget section can be easily managed (see plugin setup details). 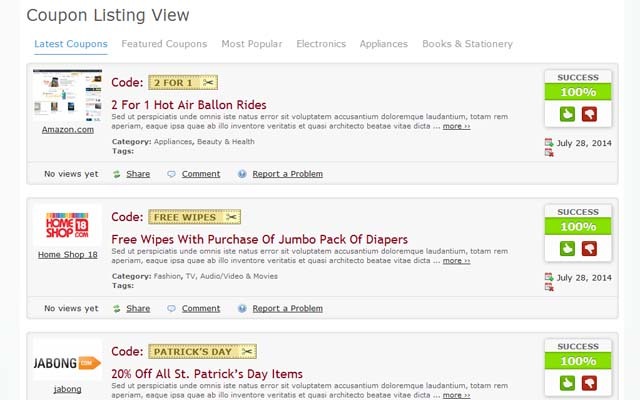 The plugin adds additional widgets for coupon listing & grid view. 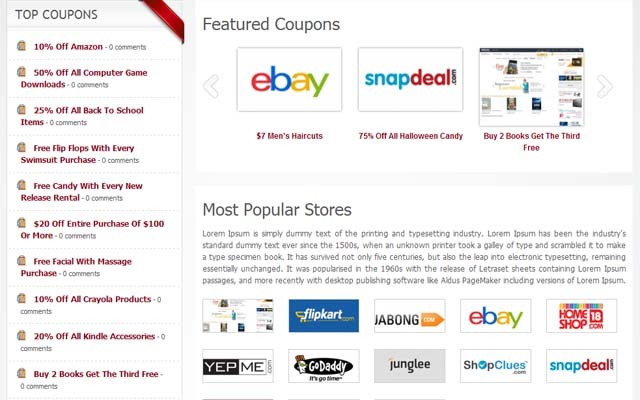 For coupon stores, plugin added separate widget with display either popular stores or featured stored option. 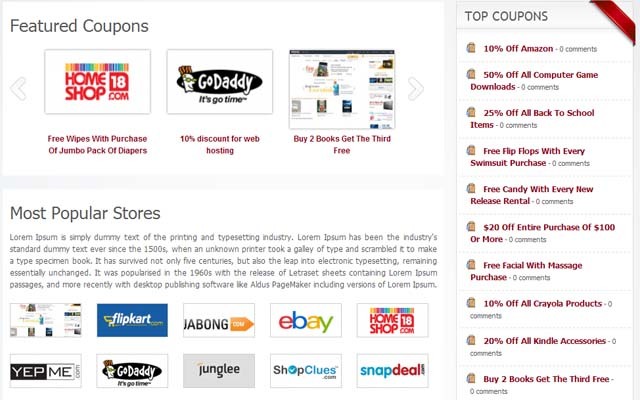 Even you can also use other suitable widgets like text widget, coupons category list widget, stores list widget to show your content or as per your idea. We making your home page easy to controlled via widget. Clipper widget ready home page, easy to manage. 3 possibility of home page, choose either home page as full width, left sidebar or right sidebar. Manage home page content section and sidebar easy via widget. 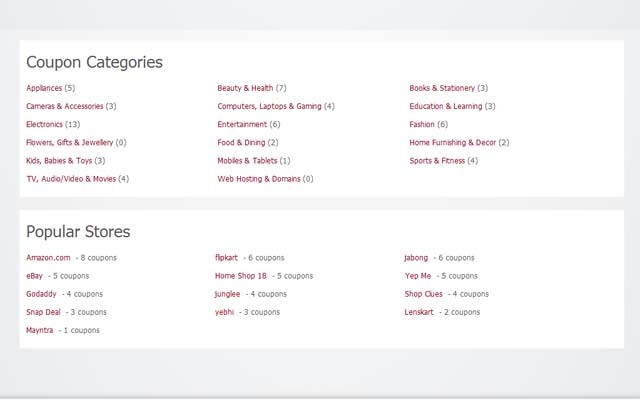 Widget with Most popular stores & Featured store display options. Additional widget for coupons list & grid view. 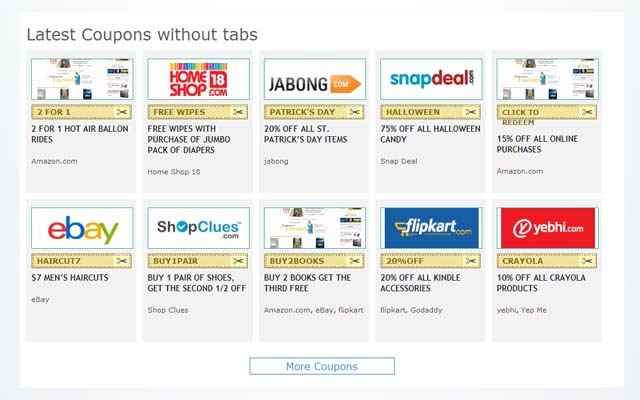 Attractive tabs view to show more than more category coupons. Display more category wise coupons via tabs easy. Attractive tabs style options and coupon code style options. Making your home page easy to controlled via widget. Completed with FLATTER child theme. Display banner slider by using “Banner Slider For Clipper“. 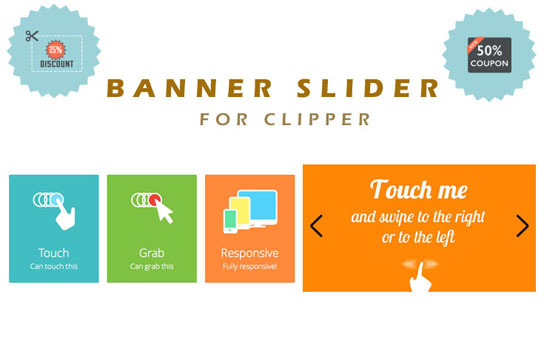 Image gallery by using “Banner Slider For Clipper“. Home page display options either full screen, full width(960px), with right and/or left sidebar. Right sidebar home page and left sidebar home page with separate sidebar for home. Display more coupons in less space. Speedup home page load by using good cache wp plugin. Featured coupons with different slide options. Recent coupons with different slide options. Popular coupons with different slide options. Random coupons with different slide options. Expiring coupons with different slide options. 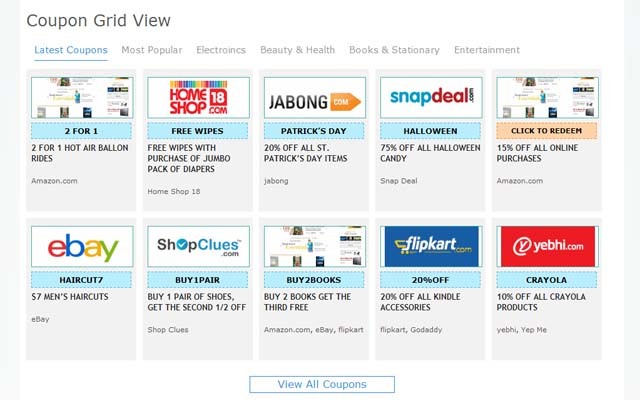 Popular coupons by total views with different slide options. 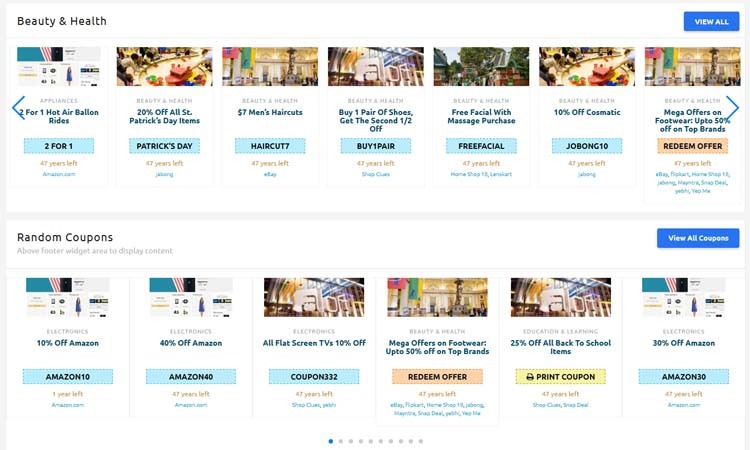 Popular coupons by today’s total views with different slide options. Different category wise coupons with different slide options. Slider per coupons settings to adjust ads as per size. 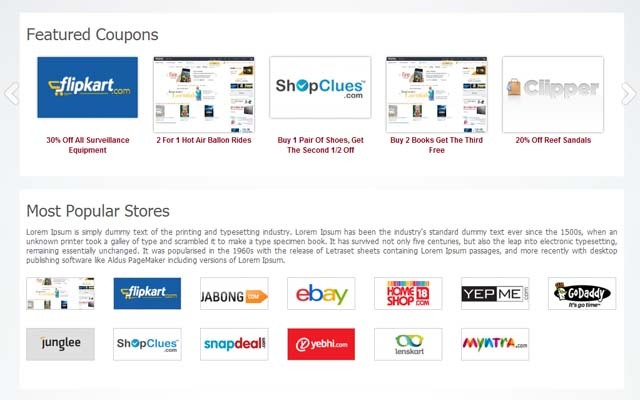 View more coupons link and set url as per settings automatically. Show/hide more coupons link, option to coupons more link url manually, change more link text and open in new tab options. Free slide mode to slide fast and flexible. All settings facility in one widget only. Use all most Clipper theme widgets for home page. Automatically adjust slider height as per data height. Simple and attractive category colorful icons. It will display only parent categories. Add category IDs to display specific categories only. Display category icons & text in different styles. 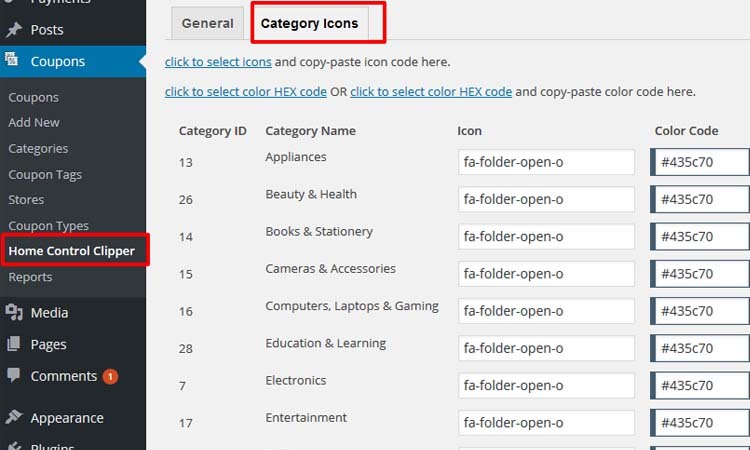 Manage category icons & color from plugin settings page. It will display stores with image, coupon count and store title. Add store IDs to display specific stores only. Store slider format different strings. 4) The plugin is mainly based on widgets. The main function for this plugin is to make home page widget ready so you can manage home page via widget area. 5) Plugin will generate new template file as per plugin code automatically while you activate the plugin. — Go to wp-admin >> Coupons (left menu) >> Home Control Clipper >> General (tab) –> see “Plugin Important Settings” at bottom of the page. — Where we have mention what to do if template file is not created. — There are many design options to set your page differently. — you can see additional widgets title starting with “WPW:” && “WPWHC”. >> “Home Content Area” –> display widget area as per design variation selected, for full width, left sidebar or right sidebar settings. — you should drag & drop the above widgets in above widget area to get it working like demo. 13) Your home page will be widget ready so you can use other widgets also. — Display category with icons by category widget. 16) See the screen image attached with the plugin folder to have visual help. — If not copied, you should manually copy and place from plugins/home_control_clipper/templates/ folder to your current active theme root folder. Please note that Add the css code in your “wp-content/themes/flatter/style.css” at after very last line if you using “FLATTER” child theme. Get related code from readme.txt OR from “flatter_theme_css_changes.txt”. — full width home page with variable size content area. — Left sidebar home page with variable size content & sidebar area. — Right sidebar home page with variable size content & sidebar area. — Change design for coupons tab widget list & grid display. — Added featured slider as per theme design & settings at top for home page template. — Plugin template new file generated and no change in theme home page template. — Now you can use theme home template and/or plugin page template both. — Plugin settings will work only for plugin template page but again widgets will work ok for theme home template without any problem. — WARNING :: Use of deprecated PHP4 style class constructor is not supported since PHP 7 >> SOLVED >> Update widgets constructor Class. — Some localization problem solved. — wp-admin > Plugin settings > category icons > display all empty and sub categries. — Category slider widget >> add category ids is replace with category selection option. — Store slider widget >> add store ids is replaced with store selection option. — Added extra widget areas so now there are total of 4 widget area to display for home page. — Category swiper slider widget with attractive colorful category icons. — Stores swiper slider widget. — Coupons grid style swiper slider widget with attractive display style. — Coupons grid widget manage slider options and auto slide options and many more from readme.txt…. Error type : footer moved in sidebar and desing broken – Solved. 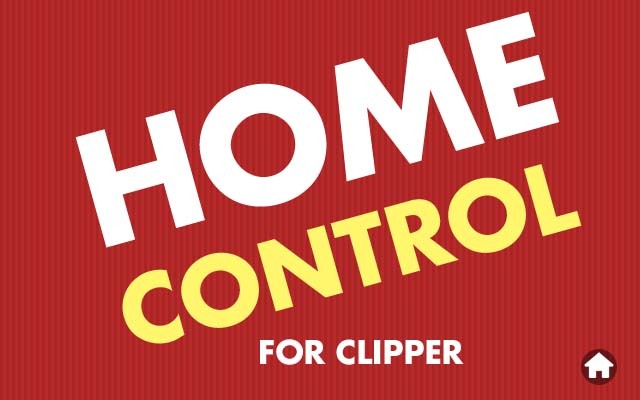 **** Update code in “home_control_clipper.php” file near line 245 & 259 as per below code. If you using older plugin and desing broken then you should uncomment it so it should work. — don’t need clipper-newhome-style.css to added in your current active theme root folder after this version(1.0.0.9). As per latest update, now it will directly included form plugin folder. — Small size screen/mobile device – scroll comes mean screen not adjust in the screen – SOLVED. — Flatter child theme – footer full width problem – SOLVED. — Flatter child theme new version updates. — Flatter child theme compatable related css added in readme.txt file, you should add those css code in your current flatter child theme style.css at very last line. I followed the instructions for the plugin setup only to discover you don’t get what the demo shows for CLIPPER THEME. The demo looks professional with the scrolling banners – that is a separate purchase, which I knew because of how much time I spent on the live demo. Here’s where the differences are. I followed the step by step setup instructions. 1st. No Sidebar. None, zip, zilch, not even an option. 2nd. On the “Categories” slider, the only symbol you get is a CIRCLE WITH A FILE FOLDER or a variation of sorts. Scroll the categories slider until you see “SPORTS/FITNESS” – That is what you get wit this plugin. 3rd. Lost Pagination – Page #’s – at the bottom of the coupon grid in the demo model you will see page numbers. When I contacted “support” I was told to use the “View All” option that comes with the plugin. It’s a button that does not look good that is placed in an odd location on the page. It was older documentation that create you confusion. You may follow the readme.txt file inside plugin folder that give your right guide. Very sorry for not updated the plugin document on demo site. The pagination and all is ok ,if you see demo site it is just added widgets in top widget area no need to add/change home page template. After latest update we have change theme home page file only so don’t worry about page template and all. I played with the live demo feature. I went through the features, pages layouts etc., I then decided to make the purchase. I started following the plugin setup and discovered it is not the same. 1. No page sidebar. The option to set up the sidebar is not there when you “add” a new page. In fact when you go to “add new page” per the detailed instructions for installation, it looks nothing like the step by step instructions. There is no Sidebar option. 2. Forget about the nice looking category slide bar. YOU DON’T GET WHAT IS SHOWN IN THE LIVE DEMO The only options you get are circles with a picture of a file folder. 3. Lost Pagination – Page #’s – In the Live Demo at the bottom of the coupon “list” Page 1 of 41 2 3 4 ›› Not available in the actual plugin. I was told to use the “View More” button that comes with the plugin. I know I wasn’t going to get the nice looking store coupons and store logos. But, if anyone knows how I can get those, let me know. This plugin is a mess if you are using Flatter theme for your site. Support guys are ok to a certain level and then they just give up. Sidebar Page not supported. I’ve waited for a response/fix! DONE WAITING! No pagination – page numbers disappear under the grid coupon screen. Stores, coupons, etc., do not appear as large as in the demo. Live version makes them smaller. “View More” button is nothing what it looks like in the Demo model, or even in the placement of it. It is a blue box that appears all the way on the right hand side with no adjustments to move it anywhere. I knew I wasn’t going to get the logos or banners. If anyone knows where I can get the store logos as listed on the demo I would appreciate it. As far as the Banners that are shown with the nice advertisements, you would pay extra for, which I knew before I purchased this. It is document misunderstanding, please refer readme.txt file inside plugin folder. Or you may email your wp-admin access so we can help you for home page setup. 64 | WARNING | Use of deprecated PHP4 style class constructor is not supported since PHP 7. 706 | WARNING | Use of deprecated PHP4 style class constructor is not supported since PHP 7. 826 | WARNING | Use of deprecated PHP4 style class constructor is not supported since PHP 7. We have updated the plugin so now no such error in future. unfortunately cant update anymore however the old plugin is not usable with php 7. Do have to pay for this update or can you send me just the updated files? You may try latest plugin because in latest plugin we have added new widgets and feature other every things is same as previous version. You can get latest plugin download from marketplace >> dashboard and get replace above files. OR email me your current version of plugin zip folder OR plugin folder/includes folder. — I give you updated so your problem will solved. Earn more revenue by add banners slider that make your site attractive.